AA few months ago I was working with a 10 year old girl I’ll call Jennifer (as always, names and details changed). I was initially working with Jennifer on helping her reduce her anxiety about friendships. However I soon noticed another challenge for Jennifer: her struggle to show positive emotion. Despite us doing a lot of play, games and rapport building in sessions, Jennifer never smiled and found it almost impossible to talk positively or enthusiastically about any of her interests, upcoming events or positive memories. When I asked Jennifer’s Mum about this, she told me that Jennifer was like this at school and in other situations too – and had been like this for some time. I talked with Jennifer and Mum about whether they would be prepared to try an experiment with me - to try to increase the number of times Jennifer showed positive emotion in the form of smiling, and enthusiastic, interested or positive comments with friends and family - and to see whether it helped her anxiety and relationships. To find out more about our experiment, read through to the end of this article. Some children smile less frequently, and/or show less enjoyment, interest, excitement or happiness in their words or faces than other kids. They have a “blank”, sad or worried expression on their face a lot of the time, often stay quiet when something positive happens to them, or talk much less enthusiastically or positively about their interests compared to other children. Why do some children struggle to show positive emotion? Have some big emotional/mental health challenges, such as social anxiety or depression. Have social functioning challenges, for example symptoms (or diagnosis) of autism spectrum disorder. Unfortunately for these children, there is growing research which suggests the act of smiling, and talking enthusiastically is important for well-being in both adults and children. For example. Experimental studies in which people are asked to “rate” others (after a brief conversation with them) find that people who smile more frequently are rated as smarter, more likeable and likely to be better friends than people who smile less frequently. Questionnaire based studies which ask parents how often their children show positive emotion find that parents who believe their children show frequent positive emotion say they have a better relationship with them than parents who believe their children don't show positive emotion very often (this is true even if the child has other behavioural or mental health challenges). Studies which ask parents and teachers how often a child shows positive emotion find that "happier" children have better friendships with other children. Studies of adults who talk more enthusiastically and positively in the workplace show that these people are more likely to have better work satisfaction, productivity and career success. There are even experiments which have been done showing when people are told to “fake smile” they experience a short term boost in mood. This research of course has flaws - it may be that people who show positive emotion have other things going for them, which will help their relationships, mood and well-being. There also may be some cross cultural differences in the importance of smiling. . However there is a fairly consistent message that smiling and using enthusiastic sentences - at least some of the time - is probably helpful for both adults and children’s health mood, well-being, work and relationships. Given how important showing positive emotion is for relationships and well-being, we should be helping children to learn how to show positive emotions around others. But we need to do it carefully. Here are two potential mistakes we can make when doing this. Mistake one: Giving children a (direct or indirect) message that it’s not okay to show disappointment, anger, sadness or worry. It’s important children know it’s okay to show these negative emotions. We certainly don’t want children feeling bad about feeling bad. We want them to know that there are many times, places and people to talk with and show feelings of worry, anxiety, sadness and frustration. Mistake two: Giving children the message that they should frequently “fake” being happy to make others feel good. We don’t want children to have to pretend they are happy. Living with authenticity is an important part of well-being. Instead we want children to know that it is important to tell us when they are feeling bad but to also notice the "seeds" of positive emotion in themselves and to show this to some people, and in situations and places. I went through these steps with Jennifer and her Mum. I carefully talked about why I thought this might be helpful for her to talk enthusiastically about some topics, avoiding any sense of blaming. We talked about times in which she could say some positive sentences, wrote down some positive sentences, and she kept a record of how many times she did this over a few days. Jennifer’s Mum told me that her teacher had noticed a difference in her the very next day. Both Jennifer and her Mum were keen to keep trying to work on this area. This might be something you’d like to think about in your family too. 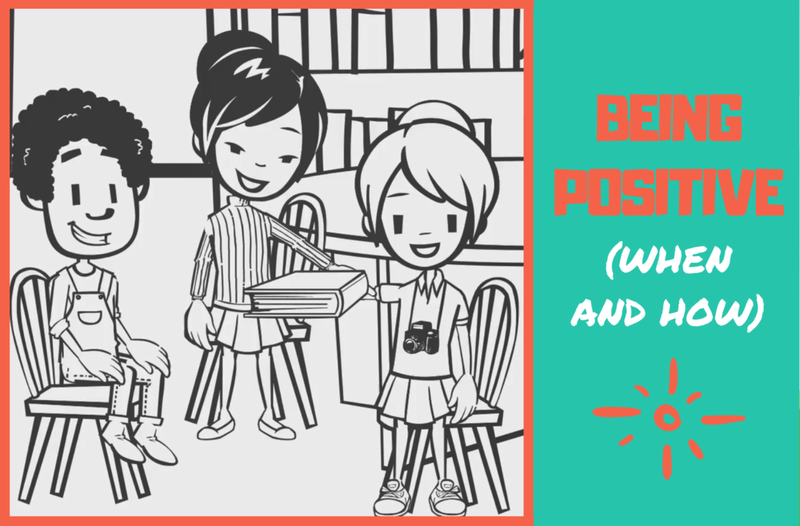 In Calm Kid Central, we have a short animated video which is called: “Showing positive emotion” which walks children through why positive emotion matters and steps to take to show it, and an activity sheet for them to help them find ways to do this. If you’d like to get access to this today, then click on the button below. It’s not “bullying” - but now what?